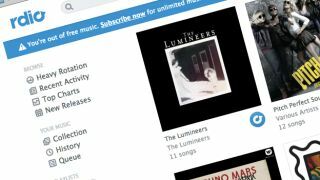 Music streaming service Rdio is bidding to lure customers away from rivals Spotify and Deezer by offering free streaming for 6 months. The US-based portal is offering ad-free, metered access to its library of over 18m songs in the hope of attracting users to one of its subscription services. Rdio, which launched in the UK last May, enables users to stream music through the Mac and PC desktop clients and via their favourite web browser. As well as the UK, folks in Australia, Belgium, Canada, Denmark, Estonia, Finland, France, Netherlands, New Zealand, Norway, Portugal, Spain, and Sweden can grab the free tunes. The offer, which also allows users to collaborate on playlists and social sharing, mirrors that available to new sign-ups in the United States. After the six months is up, users will be encouraged to fork over £4.99 a month to continue accessing music. Like Spotify, the company also offers music through a series of mobile apps, a subscription to which costs $9.99. Reports on Tuesday suggested that Rdio was adopting the 'freemium' approach in its struggle to keep up with Spotify and Deezer, both of which have an exponentially larger number of monthly active users.